David Oldfield (left) with Craig Mackail-Smith. New assistant manager David Oldfield insists it’s a privilege to be back at Peterborough United. 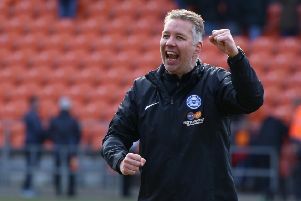 Oldfield made 99 appearances for Posh between March 2000 and August 2002, scoring five times under the management of Barry Fry. David Oldfield (right) on the Posh bench with manager Grant McCann. He’d previously played for Manchester City, Leicester and Stoke among other clubs in a playing career of 20 years that involved just over 650 matches. And he’s enjoyed success as a coach, helping Burton Albion to a promotion from League Two under the management of Jimmy Floyd Hasselbaink before joining him at QPR. But Oldfield (49) feels at home at Posh. “I feel fortunate to be back,” Oldfield admitted. “This club is important to me so I was pleased we could sort something out over the summer. David Oldfield with his Posh player-of-the-year awards in 2001. “I knew before I came back here that I would be able to work with Grant McCann. He’s a man I knew well, but it was still useful to come and spend the last couple of weeks of last season with the players to get to know them as well. “I knew most of them through watching them live and on TV so I knew the ability was there. “My job is to help improve them a little bit in every department and if we do that we will have a chance. “Everyone can see what good ability there is in the squad. I’m interested in their mental ability as well. I want to see them show enthusiasm and appreciation for the way Grant wants them to play. “Body language is important. I will be keeping an eye on that. “I’m interested in how the players think about, and deal with, certain situations. They need to know how lucky we all are to be involved in football every day of our working lives. “This is a club that gives opportunities to young players, but they have to show the right attitude and they need to do the basics well. “So far the players have reacted well, but there is always room for improvement. Standards have to be kept high as you never know what’s around the corner in our sport. “The work ethic has to be good. Things can change very quickly in football. “There is strong leadership at this club from the chairman down and I want to add to that.